I hope you're all well and had nice weekends. 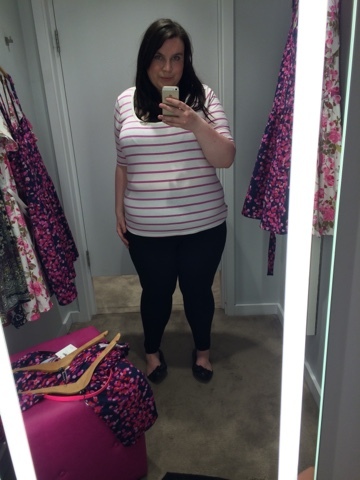 Today is something that I haven't done in a long time on the blog, since my Taking Shape store visit actually, and it's a changing room try on session. 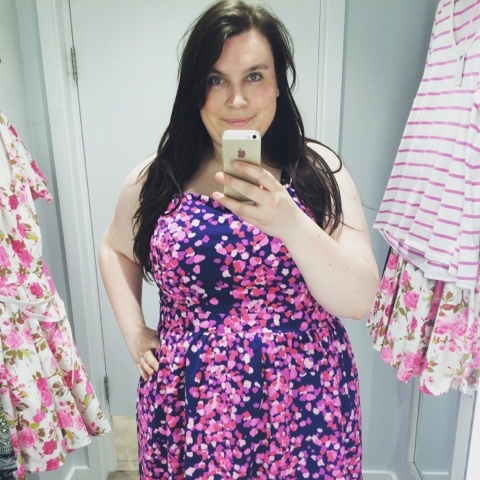 I happened to be up by Oxford Street one evening last week and of course had to make my way over to the Simply Be store which is like a plus size fashion haven and home to the nicest fitting rooms around! 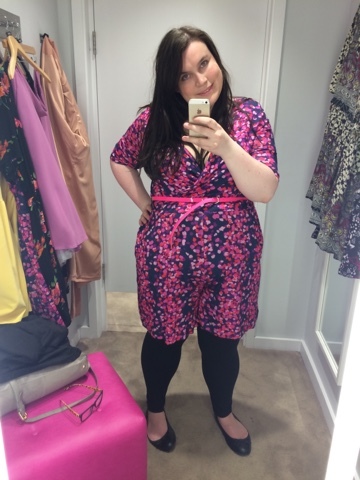 In this post I thought I'd share with you some of the things I tried on and talk a little bit about each item and whether or not I made a purchase. Apologies in advance for the quality of the photos, they were taken on my Iphone as it was an impromptu shopping expedition. 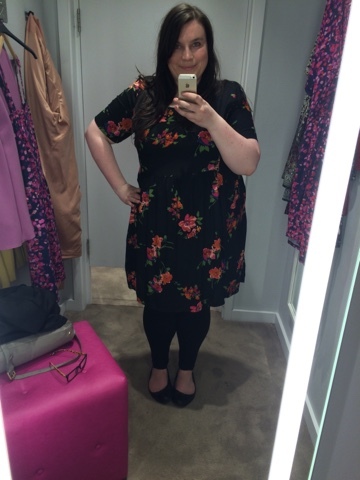 I really liked this dress, the sleeve length and dress lengths were perfect and the print is very wearable. It's not a dress I ended up purchasing because I felt it was too similar to another one I own but it's a perfect autumn dress and not too expensive at £25. I loved everything about this dress, the print is very boho and seventies style which is bang on trend, the bell sleeves are also very comfortable and end at your elbow so give great coverage. The dress nips in at the waist which gives a great shape and I like the dipped back and sides on the skirt part which flows nicely over the tummy area. I bought this dress and have already worn it to work. 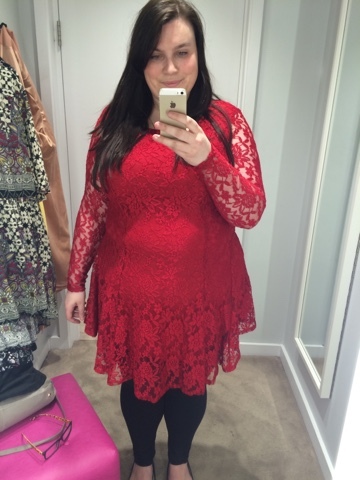 Next is a dress you might have seen me raving about on Twitter - in a good way - it's the red lace dress by Label Be. I can't find it on the Simply Be website so not sure if it in an instore exclusive. Where do I start on what I love about it? The vivid eyecatching colour first and foremost, then after that I love the sleeves which show just the right amount of skin through the intricate lace design and on top of that the dress comes in at the waist and flares out with a skater style skirt. 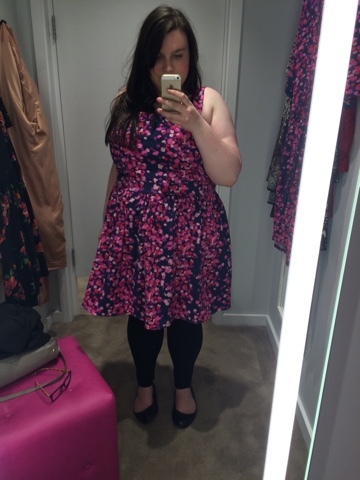 I wore this on a date on Friday night and I felt really good in it, £35 well spent in my opinion. 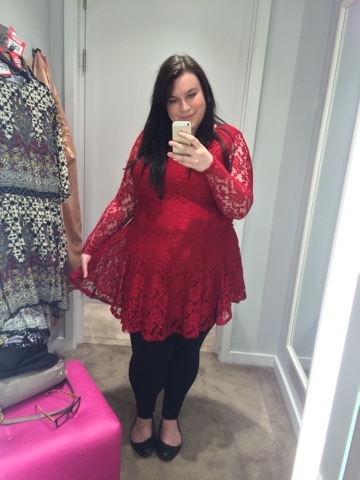 Next are the Sprinkle Of Glitter for Simply Be pieces I tried on which I was particularly excited about! 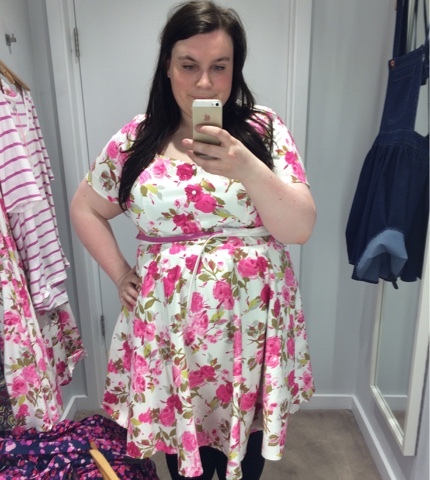 I have mixed opinions on this one, I love the sleeves, I love the print of the fabric and generally I like the shape but I just couldn't make the neckline work for me which made me sad because it really was the only issue. 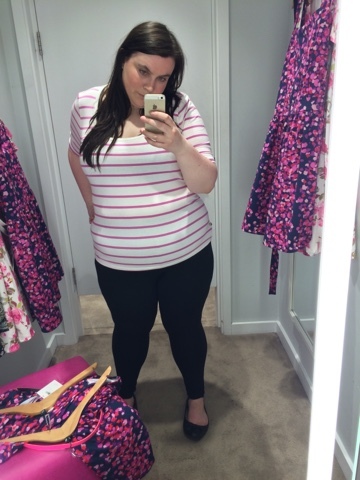 I tried sizing down and it still didn't help, I think the v-neck was just too low for me and didn't work with my body shape. I feel this has a very vintage and 50's look to it with the sweetheart neckline and a full skirt which is all fun and swishy. The print is very feminine and cute and I would picture me wearing this for something like afternoon tea or a show up in London. It went straight into my basket and I am saving it for a special occasion. 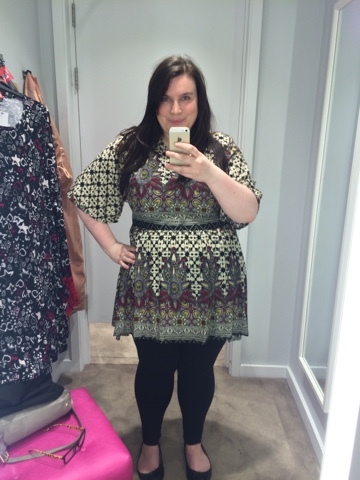 This one I adored, and it's the same gorgeous print as the playsuit. This dress worked so perfectly for me, it's a great length, great neckline and pulls in at the waist with a nice back tie. I bought it and intend to wear it throughout autumn winter with cute cardigans or a top underneath so I don't get chilly! The next look is a two piecer, the Sprinkle Of Glitter Stripe Jersey Top and the Sprinkle Of Glitter Dungaree Dress, again I have some mixed views on these. 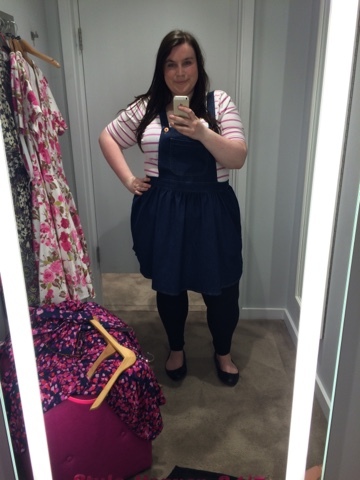 As a look together, this didn't work for me, unfortunately the panel at the front of the dungaree dress was not big enough to cover enough of the chest area and while I liked the idea, it was something I knew I wouldn't get much wear from. The top however was gorgeous, it's lovely and soft and stretchy, the sleeves are a fantastic length and the horizontal stripes go to show that the myths are false about them being unflattering. I had to get the top because I just thought I would get so much wear out of it with jeans and skirts and it's a nice casual piece. That rounds up my pretty successful try on session and I hope this gives you some ideas of the gems to be found in Simply Be at the moment. 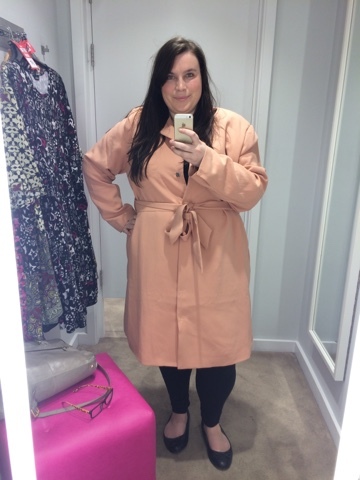 As an internet shopaholic I definitely am guilty of forgetting the pros to instore shopping like the customer service, limitless trying on and looking at the different fits of things without the fuss of returns, I definitely think it's something I need to do more often! Let me know if you'd like to see more posts like this in the comments, I work in London so it's quite easy for me to get to big flagship stores and maybe we could do Evans next.